“I’m extremely lucky to have had him in my life," Green said on his podcast. 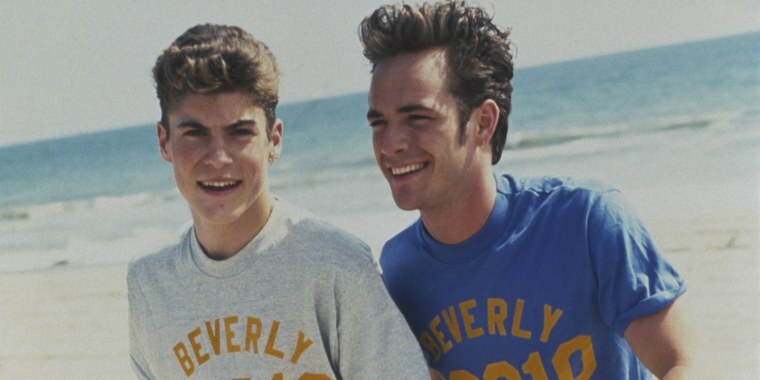 Brian Austin Green, Luke Perry’s co-star on "Beverly Hills, 90210," has joined his fellow actors in sharing his heartbreak for Perry’s passing in a podcast episode dedicated to his dear friend. Green, best known for his role as David Silver alongside Perry's Dylan McKay, broke his silence surrounding Perry’s shocking death on Thursday. Perry was hospitalized after suffering a massive stroke on Feb. 27 at his home in Sherman Oaks, California. He died five days later, on March 4, surrounded by his family and friends. On Thursday, he shared his loving memory of the man behind Dylan McKay. Green also shared how the "90210" cast came together after the heartbreaking news with “mixed emotions.” The co-stars, some of whom hadn’t crossed paths in 18 years, gathered at Gabrielle Carteris’ home to mourn Perry’s passing. Carteris played Andrea Zuckerman in the television drama. Green is now among many "90210" stars to share his love for Perry. The day Perry passed, Ian Ziering, another co-star, shared an old photo of the two hugging on Instagram. Jason Priestley, Perry’s on-screen best friend, also shared his off-screen bond with the former teenage heartthrob. On March 7, Priestley posted a tribute to Perry on Instagram. “My dear friend of 29 years, Luke Perry, was one of those truly special people who really cared... Luke was not only a star, he was an incredibly bright light that was extinguished far too soon,” he wrote. Actors Kathleen Robertson, Stephanie Beacham, Carol Potter, Paul Johansson, Emma Caulfield Ford, Christine Elise, Rebecca Gayheart, Jennie Garth, Tori Spelling and Shannen Doherty were also among "90210" cast members who shared in Perry’s loving memory.